A Lotion with a gentle soul that gives the simplest part of your cleansing routine the replenishing action of a treatment. Your skin leaves behind the feeling of dehydration and rediscovers the appeal of renewed elasticity, that invites caresses. 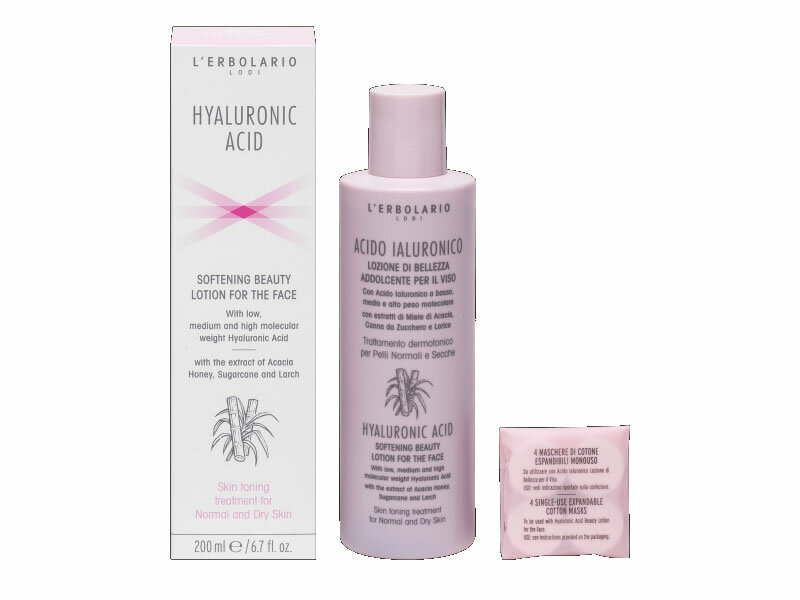 The excellent moisturising action of Hyaluronic Acid with low, medium and high molecular weights is combined with the nourishing activity of extracts of Sugar Cane, the emollient action of Acacia Honey and the refreshing action of Distilled Cornflower Water. With this dance of ingredients, your skin will rediscover its exleading role of beauty which shows through in all of its renewed radiance. After cleansing your face morning and night, pour the Lotion aonto acotton disc and gently dab it onto your entire face, neck and low neckline. Let dry before proceeding with your other routine treatments. For an intense action, once a week, soak a single use compress and apply it yo your face like a cotton mask and leave it on for five minutes. Do not rinse. Avoid direct contact with eyes- 4 Single-use expandable cotton masks included. Low, medium and high molecular weight Hyaluronic Acid, Distilled Cornflower Water, Extract of Sugarcane Leaves, Extract of Honey, Rice Lipoprotein, LArch Polysaccharides, Sugar Beet BEatine, Natural Moisturizing Factor (NMF). Aqua (Water), Centaurea cyanus flower water, Leuconostoc/radish root ferment filtrate, Sodium hyaluronate, Saccharum officinarum (Sugarcane) extract, Mel extract (Honey extract), Sodium cocoyl barley amino acids, Potassium cocoyl rice amino acids, Galactoarabinan, Betaine, Sodium pca, Glucose, Glycine, Lysine, Allantoin, Glutamic acid, Glycerin, Coco-glucoside, Sodium phytate, Glyceryl oleate, Coco-caprylate, Citric acid, Parfum (Fragrance), Benzyl alcohol.